I'll have a review of this one coming soon. Kevin posted this 9 years ago. I am just going to say, I hated Mac Barens when I first started smoking a long time ago. Now that I do not get tongue bite anymore from Mac Baren, I am enjoying this, black ambrosia, and vanilla cream,Halberg and Cube silver is amazing as well. 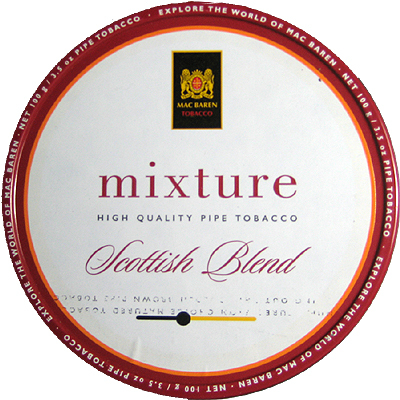 This blend has various tobacco tastes. Some medium to almost heavy with some light notes. I think it has a little casing, which allows me to smoke it in the house. Love this. I would consider it my crossover aromatic. It is a fine blend. It is the only blend available where I live, so I smoke it occasionally. But I get bored with it rather quickly, so it's an occasional thing. The "multi-plex" blends with many different tobaccos haven't clicked with me, but I haven't tried this one and may yet do it. Generically, the Scottish blends appeal to me. It surely is a good blend. I got bitten from this one many times, even in a filtered churchwarden, but after a few pouches I started to love it. When sipped extremely slowly and carefully it can really shine. I don't think it's a typically Scottish blend though but maybe somebody more experienced could tell better. I find that a few years of age greatly reduces the bite potential on this one. I get bit by both scottish blend and plumcake. I suppose there is room deep in my cellar in which I can hide these 2 blends in hopes that one day they will not bite. Sure love the Symphony though. I bought 2 pounds about 3 months ago. Missed the ashtray, just looked at it and it is a pretty nice small ashtray. I just use a 8oz tin and dump my ashes in there and put the lid on and I have my own, practical ash tray. I guess that will have to be my free ashtray. BTW, I love seeing old threads come back to life and grow. I'm with JimInks on this one. I do not smoke a lot of this, but when I do, it's at least five years old. Ten is even better. I came upon this blend by accident and it was a surprisingly happy accident. I absolutely love this stuff. I still haven’t tried the Flake but I have a tin in my queue drawer just waiting to be opened.